I’m just as surprised as you are to see a chain restaurant review on my honeymoon….but we had a really good reason. We got to Louisville fairly late. After checking into the hotel, it was after 8:00 on a Sunday, so we knew there wasn’t going to be a lot of time to do any sort of exploring. We were also pretty far from downtown out on the east side of town. On top of that, my mom had given us a gift card to Chili’s before we left. The company that owns Chili’s also Romano’s and neither of us had eaten at a Romano’s. To make things even better, we passed one on the way to the hotel. 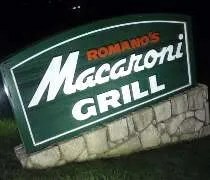 Romano’s Macaroni Grill is on the east side of Louisville on Hurstbourne Parkway. 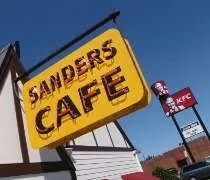 It’s in an area with a lot of other chain restaurants and small shops.